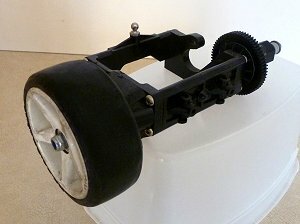 Wheel Balancing • for Radio Controlled Models. 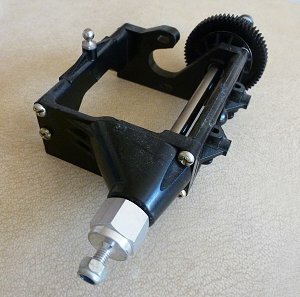 RCScrapyard ► Wheel Balancing • for Radio Controlled Models. The day I passed my driving test at the age of 17, the first thing I did was to take my girlfriends out for a drive on a long straight stretch of road close by. The road was relatively quiet that day and as I slowly went through the gears, we were soon up to 65 with no problems. As we approached 70, things changed and my hands began to sense a small vibration on the steering wheel. By the time we hit 75, the steering wheel and the whole car was vibrating wildly. My girlfriend was hysterical, screaming "slow down! ", which I did of course and the vibration stopped. Back home I told my dad what had happened. He then reminded me that just the week before we had put on a new set of front tires and suggested the wheels were probably out of balance. Sure enough, after the wheels were re-balanced, the car was steady as a rock and drove perfectly, even at speeds aproaching 90. As I got more into RC, that memory returned and I realised to be more competitive I would have to balance all the wheels of my Touring Car model. 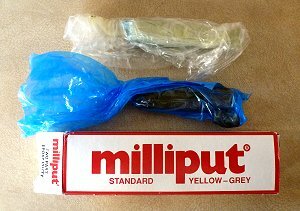 Wheel balancing equipment for RC cars is now available on line and from most RC model shops, but back then I had to make my own using the rear end of an old Tamiya F1 car. With the insert fitted and the tire mounted and glued, the wheel was then bolted onto my home made balancer and while holding the balancer tightly, I spun the wheel vigorously. Invariably it would vibrate to some degree. To balance the wheel, I would next allow it to settle, then turn the wheel through 90 degrees and again allow it to settle. Obviously the heavy side of the wheel would drop to the bottom due to gravity. Once satisfied I made a mark on the rim with a felt tip pen at the top of the wheel where it came to rest. 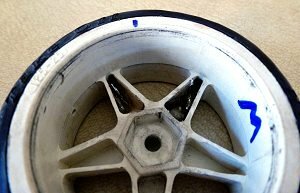 Removing the wheel, a small amount of plastic resin was then pressed into a recess on the inside of the wheel, on the side where I made the mark. The whole process was then repeated until I was totally satisfied. The final vigorous spin was always virtually vibration free.